I'm a bit behind the curve on this one but welcome to 2017! During the Christmas-New Year's week we had a lovely dinner at friend Margaret's cozy and festively decorated home. She rustled up a Viennese beef stew with noodles, as a reminder of her recent trip to Austria in early December. Her friend Kate brought a delicious and full-of-good-stuff green salad, and I, of course, brought dessert. 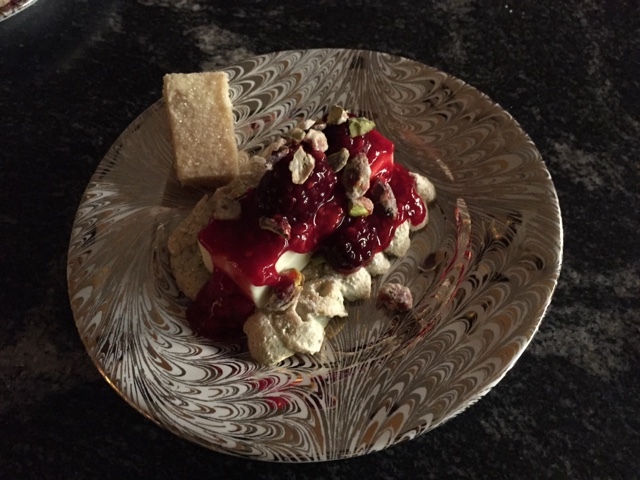 Creamy custard, lightly sweetened berry compote, candied pistachios - all nestled on a dacquoise base. Sounds pretty good! Dacquoise is one of my favorite things to make (and to eat, yes sir!). It's basically a soft nut meringue with the same ingredients as the popular and trendy French macaron, but it is WAY less fussy and tastes great too. 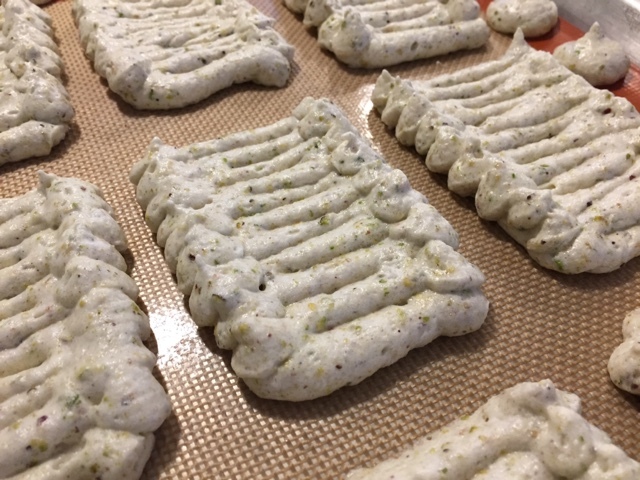 Having egg whites in the fridge is often the impetus I need to make dacquoise, and so it was that I began to imagine a pistachio version for my dessert creation. The recipe: in a separate bowl whisk together 50 g almond flour, 50 g ground unsalted raw pistachios and 75 g confectioners sugar. In a mixer with the whisk attachment whip 3 egg whites with 25 g granulated sugar to stiff peaks. Gently fold in the nut/confectioners sugar mixture just until blended. NOTE: you can use any ground nut, either by itself or as a mix - almond, pistachio, hazelnut, walnut or pecan - you decide. Once the dacquoise is mixed you can pipe any shape you choose, depending on your dessert vision. You can see what I did below. 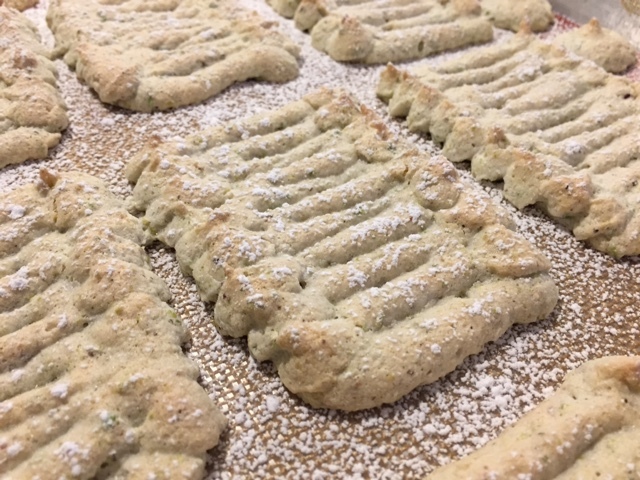 I think of these as dacquoise rafts just waiting to float down a dessert river, and, in this case, destined to carry a creamy ricotta custard ingot. Dacquoise is one of the few things for which I use silicone baking mats. The softly baked meringue lifts off the Silpat so easily. It's a beautiful thing. And another plus is you can make these ahead and freeze them until ready to go. 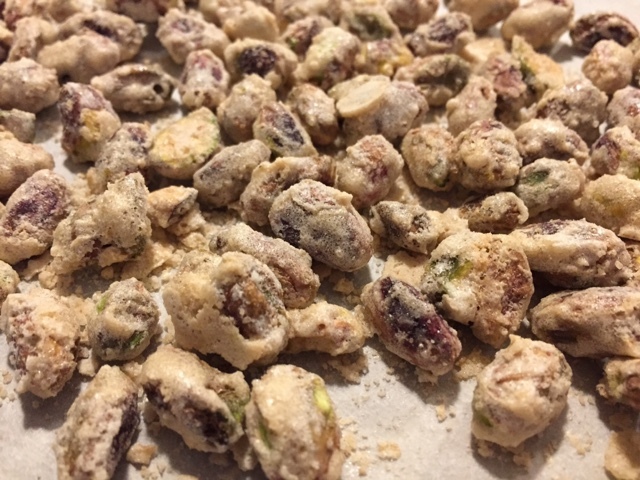 Candied pistachios are next. Adjust the recipe depending on the quantities you need, but a typical base recipe calls for 2 cups raw nuts, about 1/2 an egg white, some sugar as well as spices of choice if that's what you're after - cinnamon, nutmeg, ginger, coriander, even a little cayenne pepper - it's up to you. Just whisk up the egg white until foamy, whisk in about 1/4 cup sugar (and the optional spices) then stir in the nuts until coated. Spread out onto a parchment or Silpat lined pan and bake at 325ºF, stirring every 10 minutes or so, until the egg whites have dried and things look toasty. It usually takes about 20-25 minutes for me. Good news - the nuts are another do-ahead component that will keep at room temperature in a covered container for many days. The beauty of these is they aren't really very sweet, even though coated in sugar - just deliciously enjoyable! The ricotta custard is a combo of 177 g ricotta, 354 g cream cheese, 112 g sugar, 2 eggs, 1 egg white, seeds from 1/2 scraped vanilla bean and 177 g heavy cream. Beat the cheeses, sugar, vanilla bean in the mixer until smooth, beat in the egg and white, then add the cream and blend. Pour the custard into flexible silicone molds of choice. I used Silikomart's SF026 12-well ingot shaped mold. Place the molds on a sheet pan, pour some hot water in to bathe the lower half of the molds and bake at 275ºF until the custard is set. The time will vary depending on the size of your molds (for these it took 20-25 minutes). This recipe made about 20 custard ingots. Once baked, let the custards cool to room temperature then put them, mold and all, into the freezer until firm. Then you can pop them out of the molds and store them frozen. Yay! Another do-ahead. In the afternoon on your designated dessert day, just place the frozen shapes onto your chosen bases and refrigerate to thaw before serving. The custards hold their shape and are ready to garnish and enjoy! I made a berry compote with a mixture of raspberries and blackberries (total 300 g) in a saucepan with 40 g of sugar and some lime zest. Heat 'em up until the berries break down a bit then stir in a cornstarch slurry (2 teaspoons cornstarch whisked in 1 tablespoon warm water) and simmer a few minutes until the mixture thickens. Serve it a bit on the warm side or refrigerate it until ready to use. By now you know - do-ahead!! What a luscious combination enjoyed by all! And a simple vanilla shortbread on the side added that extra special something. Happy New Year from The French Tarte. Here's to all the baking and dessert creations to come!